Explore the highlights of famed Los Glaciares National Park of Argentine Patagonia on this classic adventure. Unlike more extended Patagonia tours, this itinerary is designed specifically for travelers with a limited timeframe. Begin in elegant Buenos Aires, where you will spend a full afternoon exploring the capital before flying to the heart of Patagonia. Enjoy a full day of exploration on the pristine Perito Moreno glacier, with an option to don crampons and hike on the glacier. Experience Patagonia’s stunning mountains, crystal clear lakes and hike two classic treks to Mt. Torre and to Mt. Fitz Roy. Our Classic Patagonia Adventure is an excellent introduction to all that the region has to offer. Hotel Las Torres is a rustic hotel extremely well-situated at a hub of Torres del Paine National Park near the trailheads for several well-known hikes: through the Ascencio Valley to the base of the Towers of Paine, through Valle Encantado to Lago Paine, and along Lake Nordenskjold to Los Cuernos and French Valley. The lodge has 84 cozy rooms with views of nearby hills and rustic, yet stylish, ambiance perfect for resting after an ambitious day exploring the Park. The convenient location and larger size of the hotel allows for around 10-15 different activities to choose from daily each with groups of up to just eight travelers, ensuring ultimate flexibility without sacrificing personal attention. The lodge has many comfortable common areas, a bar with delicious artisan beers and regional wines, an extensive spa, and a restaurant featuring home-styled cuisine that incorporates meats and vegetables from the hotel’s nearby organic farm. Upon arrival in Buenos Aires, a Southern Explorations guide will meet you and take you to your hotel. Spend the rest of the day at your leisure, enjoying the many sights and sounds of this sophisticated metropolis. If you like, add in our Four Balconies tour extension for an excellent guided overview of the capital. For those interested in learning about the formation and recession of glaciers during their Patagonia tours, a visit to the Glaciarium is a must. This one-of-a-kind ice museum is located six miles outside El Calafate. To get there, every hour on the hour, buses leave from the center of town. After exploring the history of the Patagonian ice fields, you may cap off this memorable experience with a drink at the museum’s Glacio Bar. The entire bar including the drink cups, tables and chairs are made entirely of ice. **The upper age limit for the regular Perito Moreno excursion is 65, regardless of fitness level. Please click here for alternative activities available for those over 65. Santiago & Surrounding Vineyards - The fertile heartland, this midland area of Chile enjoys a Mediterranean climate, with maximum temperatures averaging 82°F (28°C) in January and 50°F (10°C) in July. The rainy season lasts from May to August. Evenings and nights can be cool, even during the summer. General Patagonia - The area south of Puerto Montt and Chiloé covers about 30% of the total land area of Chile. It is a rugged, mountainous region of tremendous beauty. Westerly winds and storms often drop enormous amounts of snow and rain on the seaward slopes. In the Magellanes and Tierra del Fuego areas, temperatures in summer average 52°F (11°C). Dampness and wind chill can make it feel cooler so layered clothing and good waterproof gear are musts. The weather year-round is highly unpredictable, and in summer be prepared for incessant winds that lessen in the winter. In the shoulder season months, November and March, winds are not likely to be as strong as during the peak of summer. Torres Del Paine - The weather is famously unpredictable in this area and it is possible to experience four seasons in the course of a few hours. Average daily temperatures vary but in summer one can expect temperatures ranging between 50° F (10° C) and 70° F (20 ° C) with the occasional hot day of 78° F (25° C). Temperatures can drop to zero at night, and high winds are common in this area. Travelers should be prepared (both mentally and physically) for unpredictable and sometimes challenging weather conditions and pack accordingly. Good head-to-toe, breathable waterproof clothing is essential. A: We offer a variety of pre-planned tours online and we’d love to design a custom trip just for you. Take a look at what we have online then call an Adventure Travel Coordinator to discuss the trip that best fits your timeframe, budget and interests. Q: When is the best time to go to Chile? A: Chile can be visited year-round, although the southern regions are generally best visited in the Spring, Summer and Fall, which run from October through April. Northern Chile, due to its high desert, is pleasant to visit year round. Central Chile, in the Andes, becomes a skiers paradise from late-June to mid-September. Contact an Adventure Travel Coordinator to discuss the best timing for your preferred tour. Q: What is the weather like in Chile? A: Chile is a long country, spanning many climatic zones, and offers weather systems ranging from warm, high desert to cold tundra. Patagonia is famous for having “all four seasons in one day,” while the Atacama Desert is one of the driest places on earth. Contact an Adventure Travel Coordinator today to discuss the weather on your trip. Q: What is a typical day like in Chile? A: The typical day varies widely from trip to trip, but all tours will have full days with guided exploration. There is time for rest and relaxation, as well as independent exploration of the cities and towns you visit. 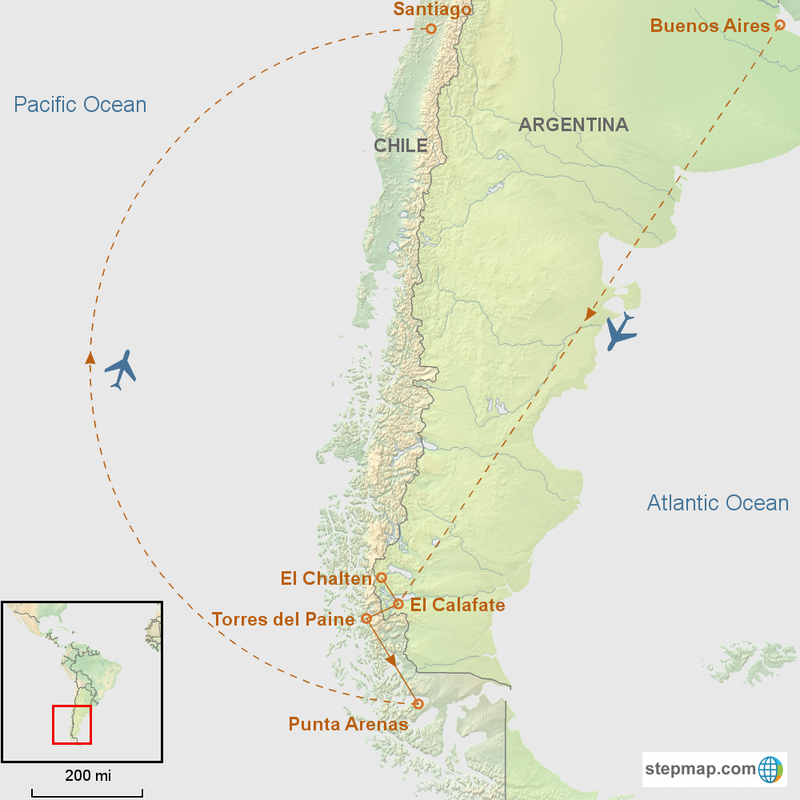 Due to the remote nature of Chile’s most scenic areas, some long travel days will be required. Q: How much time do we need to visit Chile? A: Although we have trips as short as 5 days, we highly recommend spending at least 7 days in Chile, and ideally 12. Chile has many fascinating regions and some of the most beautiful areas are quite remote, requiring extended travel time. A: As a rule, the further in advance you can plan, the more options you will have. We recommend planning a trip at three to nine months in advance, but if you want to stay at very specific luxury hotels or travel over a holiday we recommend planning nine months to a year in advance. A: We primarily work with 4-star hotels in Chile and the occasional 3-star property that meets our standards. We also work with several amazing 5-star properties and all-inclusive lodges. All of our hotels are clean, comfortable, well-located, offer en suite bathrooms and have been personally vetted by a Southern Explorations’ staff member. A: We will confirm all airfare within South America and this price is listed separately from our base tour costs. You are responsible for booking international flights to Chile. Q: How will I do laundry during the trip? A: Patagonian hotels charge very affordable rates for doing a guest’s laundry. You will also have access to laundry facilities on most days in major cities. Some of the Patagonian experiences will be true ‘wilderness’ style camping with only a river or lake as a water supply. Some locations have washing facilities where guests may do laundry. Bring biodegradable soap if you wish to do your own laundry. Please refer to the full itinerary or contact us for details. Q: I’ve heard Patagonia is very remote. What if I have a medical emergency on the trip? A: Some of our trips take passengers into some primitive wilderness areas. Our guides are trained in wilderness first-aid. To ensure the safety of our travelers, our guides are linked with outside services 24 hours a day in all locations to provide assistance when necessary. Though our guides carry extensive first aid equipment for minor ailments, injuries and accidents, they cannot handle serious medical conditions, and passengers are advised to obtain health or travel insurance that covers medical evacuation. There are small hospitals in the Patagonia region, some with 24-hour medical assistance that can deal with minor injuries and illnesses. In the rare event of an accident or broken bone, passengers would be evacuated from the wilderness area (probably by horse) and continue on the long drive out. Helicopters are available for emergencies but cannot fly during high winds. Any passengers with a medical condition or using medication should discuss this with us prior to travel.